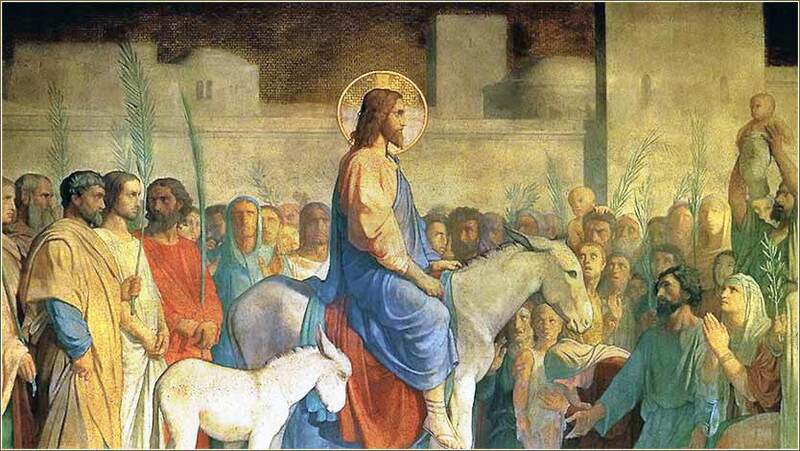 Christ’s Entry into Jerusalem, fresco on the wall of the Church of St. Germain des Pres, by Jean Hippolyte Flandrin, ca. 1848. 200 people in our community are currently praying with you. Our “Virtual Sunday Church” this week is the Edenton Street United Methodist in Raleigh, NC. Click the lyrics and sing along! the King and Blessed One. thou good and gracious King. Lyrics by Theodulph of Orleans. Giver of light, your steadfast love endures forever. Open our hearts to the Blessed One who comes so humbly, on a borrowed colt. Open before us the gates of your justice, that we may enter, confessing in heaven and on earth that Jesus is Lord. Amen. Almighty God, our heavenly Father, who sets the solitary person in the comfort of families; I commend to your continual care the homes in which your people dwell. Put far from them, I beseech you, every root of bitterness, the desire of boastful vanity, and the pride of life. Fill them with faith, virtue, knowledge, temperance, patience, godliness. Knit together in constant affection those who, in holy wedlock, have been made one flesh; turn the heart of the parents to the children, and the heart of the children to the parents; and fill us all with true love and charity, so that we put aside petty differences and act with kind affection and the sympathy of brotherly love; through Jesus Christ our Lord. God of mercy, swift to help: as my lips pour forth your praise, fill my heart with the peace you give to those who wait for your salvation in Jesus Christ our Lord. But in your hearts revere Christ as Lord. Always be prepared to give an answer to everyone who asks you to give the reason for the hope that you have. But do this with gentleness and respect. "Hosanna! Blessed is He who comes in the name of the Lord! [ Psalm 118:26] The King of Israel!" His disciples did not understand these things at first; but when Jesus was glorified, then they remembered that these things were written about Him and that they had done these things to Him. Therefore the people, who were with Him when He called Lazarus out of his tomb and raised him from the dead, bore witness. For this reason the people also met Him, because they heard that He had done this sign. The Pharisees therefore said among themselves, "You see that you are accomplishing nothing. Look, the world has gone after Him!" Today's scripture is celebrated as Palm Sunday. It was the day when Jesus was widely proclaimed as the Messiah by the Jews of Jerusalem; like Castro marching into Havana, or Charles de Gaulle marching into Paris at the end of WW2, the people widely believed that the Messiah prophesied for a thousand years or more, memorialized in the Hebrew Bible, had arrived and was marching triumphantly into the city to liberate it. As foretold, he rode on a donkey. Even the Pharisees were temporarily taken aback. The Pharisees were not necessarily Jesus' enemies. Many of them were on the fence, either as a matter of faith or simply as a matter of political astuteness. 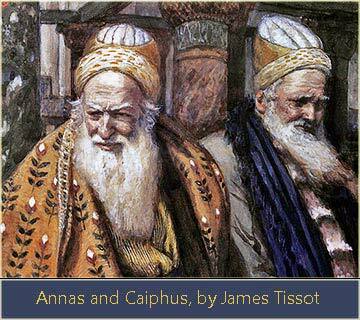 They thought that Christ was a political figure who was rebelling against the Sanhedrin — his most avid opponents were the great high priest Caiaphas and the Sadducees, including the powerful Annas. The Pharisees quoted at the end of today's lesson seem, mainly, to want to pick the winning side before it's too late. As the Jewish leaders had feared, there is a great popular swelling of support for Jesus. The catalyst for this had been the spectacular, and very public, raising of Lazarus from the dead in Bethany, just outside Jerusalem's walls. There is a great dramatic irony in the scene. We know, and the apostles know, that although Jesus is the Messiah, he does not care about earthly power and has no intention of becoming the temporal king of Israel or assuming the political power of the High Priest. He is operating in a completely different sphere. His real revolution is to occur at a level most of them cannot comprehend, because they have not listened to or absorbed his teachings. The people hail him as a savior. The Sanhedrin fears him as a revolutionary leader. But, although they are correct that he comes to bring a new order, they are substantially clueless about his intentions. For he comes, not to liberate the Hebrews from slavery to Rome, but to liberate all mankind from the slavery of sin. James 4:4: You adulterous people! Do you not know that friendship with the world is enmity with God? Therefore whoever wishes to be a friend of the world makes himself an enemy of God.